8mm vs Super 8 Film, What's the Difference? 8mm film and Super 8 film look surprisingly similar at first glance, which can make it difficult to figure out which is which, especially if you have both types of film. Fortunately, when you get it up close and look at 8mm vs Super 8 film, it’s easy to spot a couple key differences which will make telling them apart much easier in the future. 16mm film should be instantly recognizable, as it’s twice the width of 8mm and super 8 film. 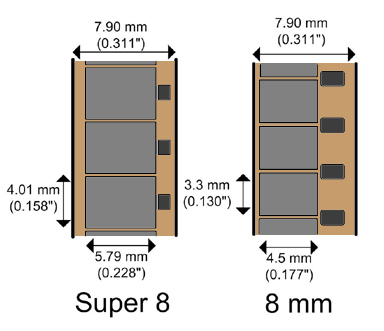 As you can see from the above image, Super8 film has much smaller sprocket holes, and they are aligned to the middle of the frame, versus in between the frames on the standard 8mm. You’ll also notice that the size of the frame is 50% larger on the Super 8 film. Super 8 was an upgrade to the standard 8mm film which offered a sharper picture. This sharper picture can be attributed to the much larger frame size. Lots of times, people will have the first of their films shot in regular 8mm, and then over time switching over to the superior Super 8 format. If your film is stored in film cans with leader tape, you can easily spot which film you have by examining the leader tape. Like in the actual film itself, the sprocket holes are much smaller. The leader tape does not contain actual frames, so the sprocket holes would be the only clue as to what type of film it is. Our film to DVD technicians are very knowledgeable and can answer all your questions about your film transfer. We are also one of the few companies who transfer 8mm film that clean every inch of the film prior to transferring. This cleaning process using silicon cloths will give you the best film to DVD transfer possible. This entry was posted in Film Transfer and tagged 8mm film, 8mm to dvd, film to dvd, Film Transfer, super 8, super8. Bookmark the permalink.